Sag Harbor, NY - July 12, 2014 - Bay Street Theater is pleased to announce the World Premiere of MY LIFE IS A MUSICAL (July 29-August 31). This musical comedy book, music and lyrics by Adam Overett, will be directed and choreographed by Marlo Hunter. Presented in association with Martin Platt, David Elliott, Cheryl Wiesenfeld with Joan Raffe & Jhett Tolentino, Patrick Blake/Cate Cammarata/Molly Morris, Jennifer Pluff, Richard Winkler, and Neal Rubinstein, with additional support from the Joseph Stein Fund for new musicals and Adriane and Jerry Cohen. Tickets can be purchased online now at baystreet.org or by calling the Box Office at 631-725-9500, open daily 11 am to showtime. A “Pay What You Can” performance is offered for the local community on Tuesday, July 29 at 7 pm. “PWYC” tickets are limited and will be available at the Box Office beginning at 2 pm on July 29. New this year, "STUDENT SUNDAY" MATINEES: Every Sunday through August 31, High School and College students can receive (1) FREE admission for the 2pm performance of MY LIFE AS A MUSICAL. Also new this year is “30 UNDER 30,” a $30 ticket for those under the age of 30. Photo ID must be shown for both ticket initiatives. 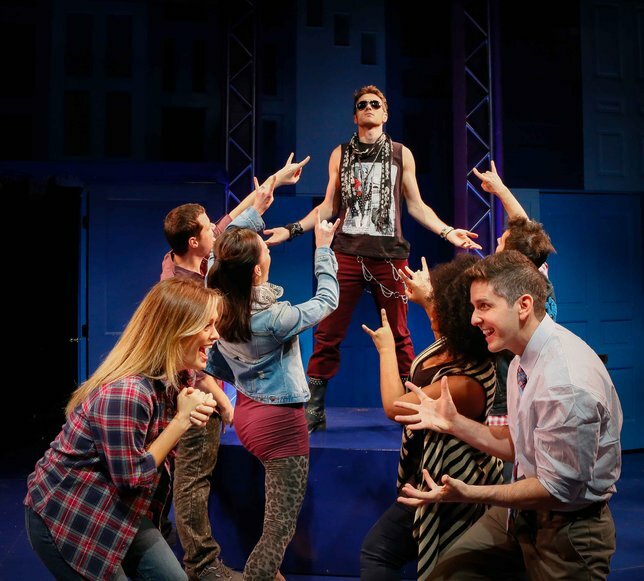 Returning this year is TALKBACK TUESDAY with Bay Street’s new Artistic Director, Scott Schwartz, and members of the MY LIFE IS A MUSICAL cast following the 7pm performance on Tuesday, August 5. MY LIFE IS A MUSICAL is about Parker, who isn't like anyone else. When Parker wakes up in the morning and leaves his apartment, he hears people singing, he sees people dancing - and no other person on earth knows this is happening. Because Parker's life is a musical. And Parker hates musicals. This world premiere features a tuneful new score by Adam Overett and direction and choreography by Marlo Hunter, two rising stars of the musical theater. Follow Parker's journey, both hilarious and human, as he struggles to hide his predicament from the world, tries to save a rock band, is pursued by a mysterious blogger, and possibly even finds love along the way. The cast stars Robert Cuccioli (Jekyll & Hyde, Spider-Man: Turn Off The Dark) as Randy, Kathleen Elizabeth Monteleone (Hands on a Hardbody, Legally-Blonde: The Musical) as JT, Justin Matthew Sargent (Spider-Man: Turn Off The Dark, Rock of Ages) as Zach, and Howie Michael Smith (Avenue Q, Carousel) as Parker with an ensemble featuring Wendi Bergamini (The Sound of Music Live!, Evita), Adam Daveline (Unlock’d, Siti Sati), Danyel Fulton (Hair, The Wiz), and Brian Sills (The Lion King, Baby on Board). The production team includes Marlo Hunter (Director/ Choreographer), Billy Griffin (Associate Choreographer), Vadim Feichtner (Music Director), Marcie Friedman (PSM), Chris Clark (ASM), David L. Arsenault (Set Designer), Amy Clark (Costume Designer), Paul Miller (Lighting Designer), Tony Melfa (Sound Designer), and Oran Eldor (Orchestrator). Adam Overett (playwright), Adam Overett is a musical theater writer and performer living in New York City. As a composer/lyricist/librettist, he is the creator of My Life Is A Musical (2013 developmental lab production at the Duke Theatre, produced by Martin Platt, David Elliott, Cheryl Wiesenfeld, Patrick Blake, Jhett Tolentino & Joan Raffe); Popesical (2012 developmental production at the Lyric Theatre in LA, 2013 concert performance at Joe’s Pub, NYC); Call It Courage (based on the Newbery Medal-winning book by Armstrong Sperry), which had its premiere youth production at the Zachary Scott Theatre in Austin, TX (2010), where it was nominated for five B. Iden Payne Awards, including Outstanding Original Script and Outstanding Production of Youth Theatre; and many other works. As an actor, Adam has appeared on Broadway and on national tour in The Light in the Piazza, understudying and performing the role of Fabrizio. He played Neil Kellerman in the national tour of Dirty Dancing, and was in the cast of Murder For Two at New World Stages, after appearing in productions of the show at Chicago Shakespeare Theatre, the Adirondack Theatre Festival, and the 42nd St. Moon Theatre in San Francisco. He originated the role of Herb in the off-Broadway show Junie B. Jones (by Marcy Heisler & Zina Goldrich, based on the bestselling book series) at the Lucille Lortel Theatre, and has performed in many other productions throughout New York City and the country. He has been a Musical Theater Fellow at the Dramatists Guild (2010-2011), a Lucille Lortel Award nominee for his contribution to the score of the Off-Broadway musical We The People (2011), and a two-time Harrington Award winner as a member of both the BMI Advanced Musical Theater Workshop and Librettists Workshop. He has also been a resident writer at the Goodspeed Mercer Colony and CAP21 (2013). His song My Sky, performed by Stephanie J. Block, is featured on the album No More Revivals, released by Sh-K-Boom Records. Adam has studied musical theater writing with Tony Award-winners Lynn Ahrens & Stephen Flaherty (Ragtime), Adam Guettel (The Light in the Piazza), and with Andrew Lippa (The Addams Family), and participated twice in the Nautilus Workshop on musical theatre collaboration at New Dramatists (2011, 2012). Adam has also authored the short musical Making The Call; the screenplay The Swallow’s Nest, and many other shorter musical theater works; and several plays, including Passport, Standing Guard, and The Birdbath. Marlo Hunter (Director/ Choreographer) is based in New York. She is the winner of the 2013 Callaway Award for Excellence in Choreography for her work on Carner & Gregor’s Unlock’d which she directed and choreographed at The Duke on 42nd Street for Prospect Theater Company. Recently she directed & choreographed Adam Overett’s My Life Is A Musical, presented as a Developmental Lab (Perry Street Theatricals, Cheryl Weisenfeld, Patrick Blake, Joan Raffe & Jhett Tolentino) at The Duke Theater, and Directed, Island Song (Words by Sam Carner, Music by Derek Gregor, Story by Sam Carner, Derek Gregor and Marlo Hunter) at the Bloomington Playwrights Project. Associate Choreographer on The Public Theater’s Much Ado About Nothing for the Mobile Unit (Chase Brock, Choreographer). In August, Marlo heads to Seattle’s Balagan Theatre to direct a workshop of Island Song, a new musical she has been developing with Carner & Gregor. She recently returned to Broadway as Associate Choreographer on Roundabout Theatre’s revival of Picnic (Chase Brock, choreographer; Sam Gold, director). In 2008, looking to push the boundaries of site-specific and full-sensory theater, she founded Eating Their Words through which she pairs prominent playwrights and seasoned chefs for an unprecedented artistic collaboration, resulting in an evening of three world-premiere plays, coupled with the bespoke menu they inspired. Through ETW Marlo has commissioned and directed new plays by Neil LaBute, Douglas Carter Beane, Theresa Rebeck, David Grimm, Annie Baker, Brooke Berman, Amy Herzog, Keith Reddin, Beau Willimon, Jonathan Marc Sherman, Sam Forman, Rob Ackerman, Sarah Treem and Steven Levenson. Marlo will be directing and choreographing Date Of A Lifetime (music by Rob Baumgartner, Words by Carl Kissin) at New Jersey Rep starring Jamie Laverdiere (Mowtowm) and Trisha Rapier (Sister Act). She is honored to have been appointed to the inaugural Artistic Advisory Board of Encores! Off-Center. Marlo’s other credits include on Broadway The Music Man (SDC Observer, mentored by Susan Stroman). Off-Broadway and Regional credits include Director of A Lasting Impression by Zoe Sarnak (The 4th Street Theater); choreographer of Spirits of Exit Eleven by Michael Puzzo (The Lion Theater, Theatre Row); Charles Grodin's The Right Kind of People (Assistant Director, Primary Stages); director, Men Are Pigs (Theatre Row, Living Image Arts). Regional: choreography for Travesties (Long Wharf and Williamstown, Gregory Boyd, director); choreography, Diva Diaries (Tampa Bay PAC, Broward Center, Chicago's Lakeshore Theatre); director/choreographer, FALSETTOLAND, director (Williamston Directing Corp.); original choreography for Alfred Uhry's Without Walls (and assistant director, Williamstown). Additional New York Credits: choreographer, Songs For A New World (Chernuchin); director ROB by Sam Forman, 508 by Amy Herzog (EST, Youngblood's Thicker than Water festival); choreographer, The Rockae (Prospect, NYMF); director, Senor Jay’s Tango Palace by Sharyn Rothstein (Vital); director & choreographer, A Time To Be Born (Lucille Lortel Theatre, Fringe); director & choreographer, Swimming Upstream, Music by Marshall Pailet (Fringe). Film: choreography consultant, Faster (documentary) directed by Robert Mac. Wendi Bergamini is thrilled to be joining this fabulous company at Bay Street Theater for the world premiere of MLIAM! Her Broadway credits include Evita; Promises, Promises (Miss Olson); South Pacific. Her National Tours include The Light in the Piazza (Franca,1st National), Guys & Dolls, Evita (25th Anniversary tour), Cats (Jellylorum). Her Regional credits include Secondhand Lions (Ghita), Finian’s Rainbow (Westport Country Playhouse), The Baker’s Wife (Goodspeed Opera House), Titanic (CLO South Bay Cities), The Grapes of Wrath (The Western Stage). Her NY credits include The Baker’s Wife (York Theatre), Naughty Marietta (Musicals Tonight! ), Iolanthe (NYGASP). Her television and film credits include The Sound of Music Live! She also performed worldwide aboard the famous QE2. Robert Cuccioli has appeared on Broadway in Spider-Man: Turn Off The Dark, Jekyll & Hyde (Tony nomination, Drama Desk, Outer Critics Circle Award and Chicago’s Joseph Jefferson Award), Les Miserables. He has also appeared Off-Broadway in Bikeman, Temporary Help, Enter The Guardsman, And The World Goes ‘Round (Outer Critics Circle Award), Gigi, The Rothschilds, Jacques Brel Is Alive And Well And Living In Paris and Dietrich & Chevalier. Equally respected for his work in the Classics and Contemporary Plays as well as Musicals, Robert has performed at such notable Regional Theatres as The Guthrie (Antony & Cleopatra), Paper Mill Playhouse (1776, Oklahoma, Lend Me A Tenor, Jesus Christ Superstar, The Sound Of Music), The Shakespeare Theatre of NJ (Amadeus, Julius Caesar, Macbeth, Carnival, Othello), The Shakespeare Theatre of DC ( Hamlet, Lorenzzaccio 2006 Helen Hayes Award Nomination), the McCarter Theatre (Fiction, The School for Scandal), George Street Playhouse (The Seafarer, A Moon To Dance By with Jane Alexander) and most recently at the historic Ford's Theatre in Washington, DC (1776). He has also appeared on Television shows including White Collar, Sliders, Baywatch, The Guiding Light. His Film credits include Woody Allen’s Celebrity, and the independent film The Stranger. Robert is featured on the original cast recordings of Jekyll & Hyde (Atlantic), And The World Goes ‘Round (RCA Victor), Jacques Brel Is Alive And Well And Living In Paris (Ghostlight), The New Picasso (Black Forest Productions) and released his debut solo album The Look Of Love in October 2012. Adam Daveline is thrilled to be a part of My Life is a Musical. Some of his Off-Broadway and New York Credits include Unlock'd (Prospect Theater Company) Siti Sati (Tera Nova). Some notable Regional credits include Mr. Robert Martin in Jane Austin's Emma directed by Jeff Calhoun and Lord Amiens in As You like it at the Old Globe Theater directed by Adrian Nobel. Adam operates his own film production company (A.A. Bar Productions) and has written/produced/directed/and acted in many short films, and is currently working on a new web series entitled Molly Mo. Adam proudly received his BFA in Musical Theater from Brigham Young University and his MFA in Classical Acting the The Old Globe/University of San Diego. Danyel Fulton graduated from The City College of NY with a B.A. in Theater. Selected NYC credits include Ammut and Others (Jasper in Deadland, Prospect Theater Company), Marie (Dark Hollow Woyzeck, Fringe ’12), Aisha (A Time To Love, National Black Theater), Dorothy (The Wiz, The Harlem Repertory Theater), Charlayne (Aint Misbehavin, HRT), Lil Bit (How I Learned to Drive, Aaron Davis Hall). National/International Tour includes Dionne (HAIR, Big League Theatricals), Audelco nominations for Outstanding Female Performance in The Wiz in 2009, Aint’Misbehavin in 2008, A Time To Love in 2012. Kathleen Elizabeth Monteleone recently played Heather Stovall in Broadway's Hands on Hardbody, a role she originated in the musical's premiere at La Jolla Playhouse. Other credits include Dede Halcyon-Day in Tales of the City (American Conservatory Theater), the national tour of Legally Blonde: The Musical (Elle Woods); Sophie in Departure Lounge (SPF) and Amber in Hairspray (Paper Mill Playhouse). Screen credits include NBC’s Grease: You’re the One That I Want (Spiritual Sandy) and the film 27 Dresses. She is also a graduate of Marymount Manhattan College. Justin Matthew Sargent has appeared on Broadway in Spiderman - Turn Off The Dark (Peter Parker), Rock of Ages (Drew), Bonnie & Clyde (Ensemble, Clyde cover), National Tour of Rock Of Ages (Drew) Regional credits include Pippin, Jesus Christ Superstar and High School Musical. His television credits include Royal Pains, Delocated. He received his BFA in Musical Theatre at the University of Central Florida. Brian Sills New York credits include The Machine (Park Avenue Armory & Donmar Warehouse, UK), Lucky & Tough Times (Playroom Theater), Himself And Nora (NYMF). National Tour of The Lion King (original cast). Regional credits include The Heidi Chronicles (Asolo Repertory Theater), Assassins (Milwaukee Repertory), Amadeus (Clarence Brown Theater), Around The World In 80 Days (Cleveland Play House), Cabaret, The SantaLand Diaries (Kansas City Repertory Theatre), Unlock’d (Ravinia Festival), three seasons at the Tony Award winning Chicago Shakespeare Theater where credits include The Taming of the Shrew, Cymbeline (Joseph Jefferson Award nomination), The Three Musketeers, The Two Noble Kinsmen and How Can You Run With A Shell On Your Back?. His film credits include Baby On Board, Nothing Like The Holidays, Rocky Marciano. The 2014 Mainstage Season is sponsored in part by New York State through the generosity of Assemblyman Fred Thiele and State Senator Kenneth P. LaValle; the New York State Council on The Arts, a State Agency; Town of Southampton; The Harold and Mimi Steinberg Charitable Trust; The Shubert Foundation; and the Suffolk County Executive’s Office. Previews are sponsored by Peconic Landing. Tickets on sale now at the Box Office at 631-725-9500 or online at baystreet.org. Subject: LongIsland.com - Your Name sent you Article details of "The World Premiere of My Life Is A Musical July 29 – August 31 at Bay Street Theater"